The next day Jarod was devastated to tears that the tooth fairy took his tooth, he liked having the money but not at the expense of his tooth. He sat down at the counter and started writing on a piece of paper, Erika (mom) asked him what he was doing, he told her he was writing the tooth fairy a note asking if she would please give him his tooth back because he misses it very much and and that he would take very good care of it if she returns it, thank you very much Love Jarod. 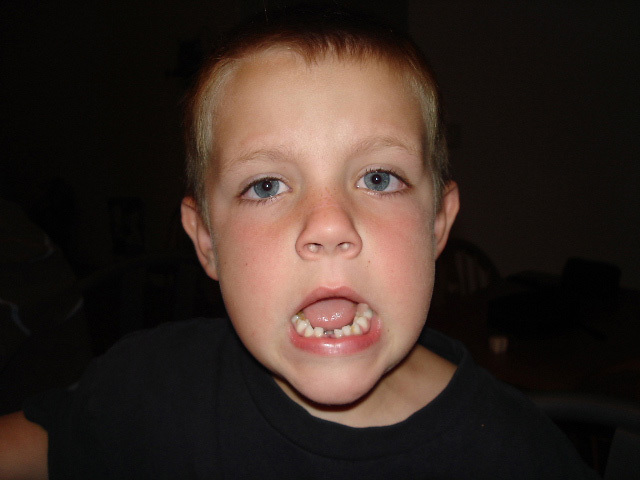 The next morning underneath Jarod's pillow was the tooth along with a note from the tooth fairy telling him that she knew he would be very careful with his tooth. It is now safely ensconced in a locked box in his room. He now has another loose tooth that he doesn't want anyone touching so it won't come out anytime soon. His parents are not encouraging this and have a little while to work on the separation issue with this one.